There is nothing more enjoyable than playing in the snow. You can build a snowman, have a snowball fight or set about building an igloo den. Whether you explore the flurries of snow in your local neighborhood or take a vacation to a snowy region of the world, snow boots are the perfect investment to keep your children happy and warm while playing in the snow. 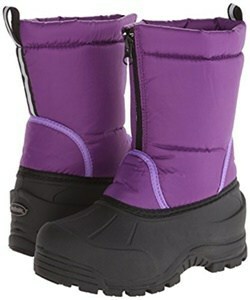 Snow boots are ideal for kids who love to run around and explore the world around them. Not only will they keep your children’s feet warm and dry from the cold snow and water, but they will also help your child to achieve optimal levels of grip, perfect for kids who want to run around, but want to minimize the risks of falling over thanks to a hidden patch of ice. However, there are a lot of things you need to know to make sure you’re making the best decision when buying snow boots for your child. You’ll want to consider the waterproof properties, grip, safety and comfort levels that will all come together to give your child the best winter experience. To give you a solid foundation to make your decision, I’ve compiled my favorite snow boots specially designed for children to give them the most enjoyable experience possible. Furthermore, to ensure you are making the best purchasing decision, my step-by-step buying guide details all the information you need to know about choosing snow boots for your kids. Here are my favorite snow boots that are perfect for getting your children outside, active and enjoying the winter world around them. To start my list, I’ve chosen one of leading brands on the market. Produced by a Canadian company, these boots are incredibly lightweight, and are marketed as being the same weight as an iPhone. This means your kids can run around freely in the snow without the problems that come with traditional heavy snow boots, such as tired legs and achy joints. These boots continue to impress as they are so easy to put on thanks to the single buckle and Velcro strap, allowing your children to put them on and go in a matter of seconds. Available in four beautiful designs, you can easily choose a pair that matches your child’s favorite color, so these will be a pair of boots that your child will love. Inside the boots, you’ll find the patented, removable Radiantex lining. This specially developed lining effectively reflects your child’s natural body heat back into the boot, keeping their feet and legs warm in temperatures up to -50°C. What's Great About It: In addition to the outstanding thermal properties, these boots pride themselves on their sole abrasion and grip benefits. Regarding sole abrasion, these boots boast 19x the industry standard and 2x the skid resistance, giving your child the safety and support they need to have the most fun possible. When choosing the ideal snow boots for your kids, comfort is one of the leading factors to consider. This is something the Kamik Rocket boots excel at. Made from the highest-quality fabrics with an impressive synthetic sole, you can be safe in the knowledge that your child is comfortable at all times while playing out in the snow. 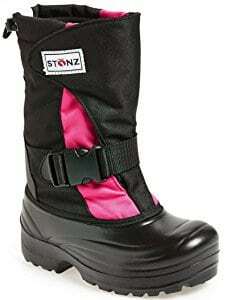 Once your child has put these boots on, you can easily tighten the buckle on the front around their angle, as well as tighten the drawstring at the top, making it impossible for water and snow to enter the boot. Inside the boot, you’ll find a hard rubber shell around the foot of the boot that protects your child’s feet from the cold, while the internal padding helps to maximize comfort. Furthermore, there’s a removable moisture-wicking foot liner in the boot that helps to soak up any moisture that may find its way into the boot, allowing you to easily remove it for drying while keeping your child’s feet dry and warm while the boots are in use. What's Great About It: When choosing a boot for your child, you want a design that they’ll love. With the Kamik Rocket boots, you have over 10 unique and engaging designs to choose from, giving your child the ability to choose their favorite, resulting in a boot that they’ll absolutely adore. If you’re looking for an affordable solution, the Northside Icicle Snow Boot is an inexpensive solution that doesn’t compromise on quality. This simple yet effective snow boot prides itself on its high-quality design and materials that produce outstanding levels of comfort while keeping your child’s feet dry and warm and all times. Some of the leading features of these boots include quick-draw lacing, toe guards, and traction soles, providing more than enough grip for your child to play care-free in the iciest, snowiest conditions. Inside the boot, you’ll find a high-quality synthetic sole that adds to the already high levels of comfort; and a thick rubber heel and sole that will give your child all the stability they need. What's Great About It: You can choose the ideal boot for your child from over 15 designs and color schemes. This enables your child to pick the best possible design to suit their personality, transforming the snow boot into a winter accessory that your kids will love. Available in eight fantastic colors, this is one high-quality pair of boots that your kids will enjoy. One of the leading features of these boots in the one-piece, injection molded rubber sole that helps to create an impenetrable seal around your child’s feet. This will keep your children happy by keeping their feet dry and warm. The unique liner on the inside of the boot helps to reflect your child’s natural body heat, storing it in the boot, adding to the already high levels of warmth and comfort. This easy-to-put-on pair of boots allows your child to quickly slip on the boots, which are fastened using the single Velcro strap around their ankles and the drawstring tie that fits comfortable around their legs. Not only does this stop snow and water from entering the boot, but it also helps to keep your child’s legs and feet warm and comfortable at all times. What's Great About It: Inside each of these incredibly lightweight boots, you’ll find a removable liner, which helps to absorb any accidental moisture that enters the boot while providing maximum levels of comfort. This liner is safe for machine washing, allowing you to maintain the highest levels of hygiene and cleanliness. To conclude my list, I’ve chosen a fantastic, heavy-duty boot that provides your children with all the features they need to have the best time in the snow. These hand-made boots pride themselves on their high-quality rubber exterior that helps to repel snow, water and ice to ensure your child’s feet stay as warm and dry as possible, maximizing comfort. Inside the boots, you’ll find a high-quality synthetic sole that offers your child comfort when they spend the day in the snow. These boots are incredibly easy to slip on, and the eight-point drawstring system allows you to quickly tighten the boots in a matter of second, eliminating the fiddle issue that was common in traditional snow boots. What's Great About It: In addition to the two available colors, one for boys and one for girls, the waterproof properties of these boots are fantastic. 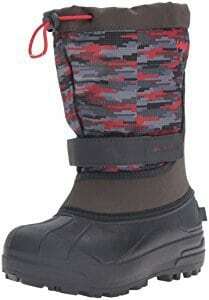 The rubber exterior and the drawstring closure design, along with the durable waterproof material, will ensure no snow or water enters the boots, keeping your child’s feet dry and warm at all times. Now that you’re aware of some of the best snow boots available on today’s market, it’s time to choose the best boots for your kids. 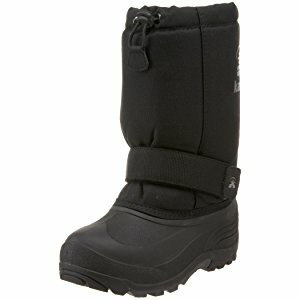 As with any children's product, you’ll want the snow boots to be as easy as possible for your child to use. When looking for the ideal pair for you, look for Velcro or drawstring closure systems. This means your child can easily slip on the boots before effortlessly tightening them for optimal comfort and support. What’s more, these closure methods are perfect for creating a tight seal around your child’s feet and legs. Not only will this expel snow and water and stop it from entering the boot, but it also helps to hold heat that assists in keeping your child’s feet warm. Running around in the snow and ice all day can take its toll on a regular pair of shoes or trainers. 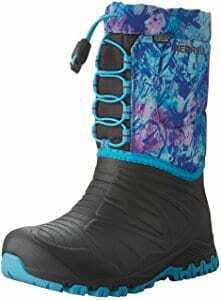 When shopping for snow boots, you’ll want to choose a highly durable pair that is up for the challenge. On the base of a good snow boot, you’ll want a thick sole, usually rubber, that enables your kids to run around on hard ice and snow while minimizing the risk of the sole being worn down over time. Likewise, where the fabric materials meet the rubber, you’ll want to make sure the seams are secure and will withstand hours of running around and snowman building. This can be easily checked when shopping in a physical retail outlet or from reviews from your preferred online store. To make things easier for you, always look for a pair of boots that come with a guarantee. If your child is running around outside in the snow for hours on end, you’ll want to ensure that their boots are giving them the most comfort possible. This can be achieved using advanced internal padding that helps to cushion your child’s feet against the otherwise hard rubber exterior of the boot. You’ll also want to check the closure method of the boot to ensure it’s not too loose or too soft. To protect your child's feet, always check that you have chosen the right size boot. Snow, ice, and water can all be extremely uncomfortable for your child. When choosing the perfect pair of boots, consider what methods your chosen boots implement to stop snow and water from entering the boot. One of the most effective methods of achieving this is a drawstring at the top of the boot which can be tightened to create a snow-proof seal around your child’s legs. The other element you’ll want to protect from is the cold temperatures. When choosing your boot, look for a product with interior insulation that will protect your child’s feet from the cold, no matter what the outdoor temperature is, or the depth of snow they are standing in is. Now that you know the ins and outs of children’s snow boots, it’s time to get out there and find the perfect pair for your kids. Take everything written in my buying guide into account, and you can be sure that you’re making the best decision for you. Now all you have to do is find the perfect games to play out in the snow, and you can start enjoying some good old fashioned outdoor family fun time.